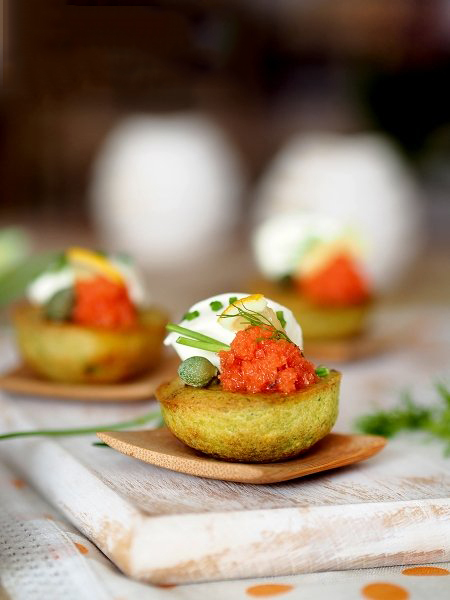 Mini pancakes with avocado and salmon can be done easily if you follow this delicious recipe. For a better taste, and why not put curd or cheese on the decoration. Clean the avocados and paste it together with lemon juice, olive oil, egg, half of the sparkling water and fresh milk. Add the flour, baking powder and spices and salt to the obtained mashed. Stir. In small silicone-hemispheric form, pour 1 tsp. of the mixture. Heat the oven to 170 degrees and bake for 15-20 minutes. If you decide to make pancakes in a pan, skip the baking machine. In a boiled and greased pan, pour 1 tsp. from the dough and fry on both sides, as do classic pancakes, blush or pencake. Divide the curd and paste it or rub through a fine strainer. Gently mix it with the remaining carbonated water to make it smooth and fluffy. Chop salmon very finely to resemble red caviar. 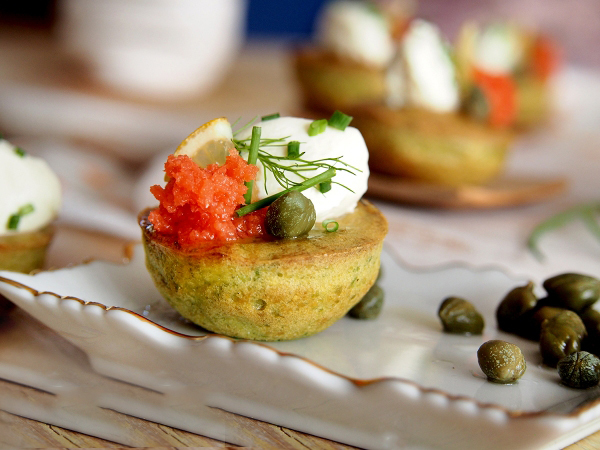 Garnish the pancakes with cottage cheese, fish and, if desired, decorate with capers and green onions. Pancakes are suitable for freezing. You can prepare them in advance and freeze. Before you serve them, defrost and garnish. You can replace curd with cream cheese, sour cream, mascarpone or other suitable cream of your choice.